The Glory of Christ in His Obedience – “Although he was a son, he learned obedience through what he suffered.” – Hebrews 5:8. This verse raises so many Christological questions. If Jesus was perfect, why would have have to learn obedience? How is that suffering teaches obedience? What does this mean for his moral perfection? Could he have gone to the cross without learning obedience? Looking at the following verse raises even more questions about his perfection as the God-man. It’s easy to get lost in a myriad of questions like these and miss the point of Christ’s passion – his sufferings. John Owen unpacks a key idea of what it means for Christ to have learned obedience through suffering. I’m indebted to this 17th C. Puritan for highlighting a most important truth – Christ’s suffering provided the context for him to existentially learn obedience. I love this, and here’s why. Jesus wasn’t born into the world as a Savior-in-a-box. Yes, he was morally perfect. Yes, he remained sinless. But he had to learn to endure. He had to learn patience. He had to learn how to obey even as he was fully able to obey and ready to do so. Golf is my sport of choice, and lately professional golf has had its share of young up-and-comers who are taking the game by storm. It’s a landscaping altering youth movement. These 17-year old kids possess phenomenal ability both natural and groomed. They are flexible and coordinated. In some sense, they have been endowed in their essence with the ability to hit a ball. However, they still need to learn to hit the ball. Even if it could be imagined that a child had the ability to hit a golf ball and never mess up, that child would still have to learn how to hit a ball, how to execute a shot, and it would still be hard work. Jesus learned obedience, and he learned it through what he suffered. 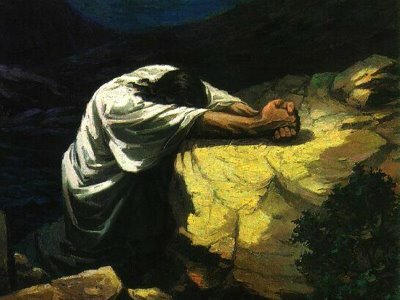 The grace and humility of Christ cannot come to unique expression except through his sufferings. But that’s not all. In yet another example of how unique our God is, Jesus experiences the sufferings and learns obedience in the real-life classroom of life. He learns how to endure, to suffer, and to die. You might object and say that he was going through formalities of it, but the truth still remains that he went through them, and actually chose to go through them, nonetheless. He may have been perfect, but he still learned obedience in much the same way you and I do. How does this make him glorious? Jesus validates the human experience by learning obedience in the midst of it. He really is a high priest who is able to sympathize with our weaknesses because he came close to the edge, being tempted in every way, yet didn’t go off the cliff like we often do. He endured temptation and suffering, and he learned obedience even when that obedience led him to death on an undeserved cross. In fact, the suffering that paved the way to the cross was the teacher. Today, as you fight for obedience, remember Jesus. That he knows and understands. He learned obedience the way you and I will be called to today, and he came out victorious.